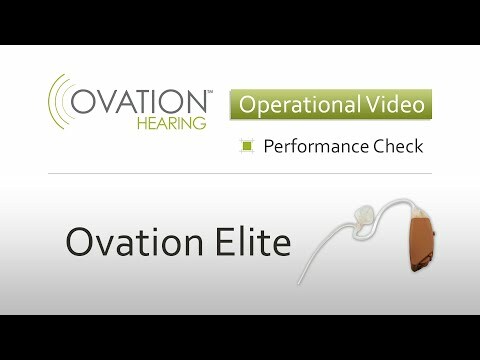 Please take a few moments to watch this Quick Start video to ensure proper use and care of your Ovation Elite Hearing Aid. Wearing your Ovation EliteTo place the device in your ear, follow these simple steps. Start by placing your Ovation Elite over your ear, until the device rests comfortably and securely behind your ear. Then, while holding the device in place behind your ear, use your other hand to insert the ear tip into your ear canal. Lastly, curl the retention loop along the body of your ear. Battery LifeThe battery life for your Ovation Elite is about 7 days. You will hear a series of double beeps when the batteries need replacement. Changing BatteriesTo insert a new battery in your device, first use your fingernail to gently open the door on the bottom of your unit. Holding the plastic tab attached to the battery, place the new battery in the battery compartment and carefully remove the plastic tab. To fully activate the battery, wait for about 2 minutes before closing the battery door. OperationThe battery door serves as the On-Off switch for your Ovation Elite. If the battery door on your unit is open, your device is OFF. If the battery door on your unit is closed, your device is turned ON. Program SettingsYour Ovation Elite Hearing Aid offers four different program settings, allowing you to hear comfortably in nearly any listening environment. To change program settings, simply press and hold the push button for two seconds. Your unit will beep to let you know which setting has been selected. CleaningTo ensure optimal performance of your Ovation Elite, it is important that you clean it at least once per week. Start by removing the ear tip from the ear tube. Then, remove the ear tube from the device. Use a dry cloth or the cleaning brush that was included with your hearing device to remove any ear wax or debris from the ear tip. To clean the ear tube, use the cleaning wire that was also included with your Ovation Elite. Thread the cleaning wire through the ear tube, starting at the device end, until it comes out at the ear tip end. Then pull the wire all the way back through the tube. Learn troubleshooting tips for your Ovation Elite hearing aid.